MANGAGWA’S ZANU PF REGIME, PURGES AT LEAST FOUR CIO for allegedly being too close to former CIO director-general Happyton Bonyongwe, who is also former Justice minister, and Mugabe . At least four directors in the Central Intelligence Organisation have been retired, or allegedly being too close to former CIO director-general Happyton Bonyongwe, who is also former Justice minister, and Mugabe . 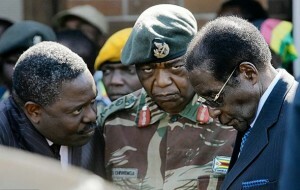 photo- former CIO director-general Happyton Bonyongwe (L), RTD Gen Chiwenga, now vice president and the deposed former president Robert Mugabe.